Surprise! Can you tell what I'm eating from this picture? 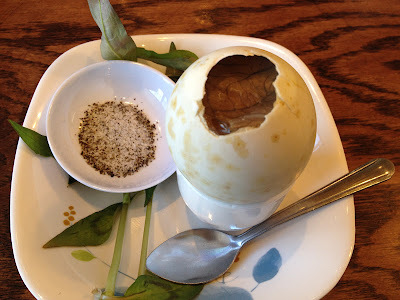 Hint: It's called balut in Tagalog or Hot vit lon in Vietnamese. It's actually a fertilized duck embryo. Sold usually as street food throughout Southeast Asia, many people consider it in the bizarre foods category. I haven't had balut in years. I guess my bizzare foods gene kicked in when I was young. I remember being in elementary school and asking to try balut. I question why my mother didn't stop me at such a young age. Oh, well it all makes sense now... she must have known I'd turn into an street-food-eating monster! 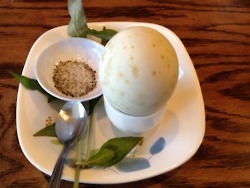 This balut was from a Vietnamese place so it was eaten with salt, lemon juice, pepper, and mint leaves. Sometimes if you get an egg that is more developed, you'll get a peek at a pretty developed fetus. You'll see hair, bones, beak, etc. No worries though. None found here. So why do I eat balut aside from my bizarre food tendencies? The soup that comes from the egg is delicious. Chicken noodle has nothing on it! Such a rich, rich flavor. The duck soup is much better than chicken soup. If you are a soup lover and scared of balut, I'd recommend just cracking open the egg and sipping the soup if you are scared of eating it. The yolk inside is also delicious. It much more flavorful than any regular egg. 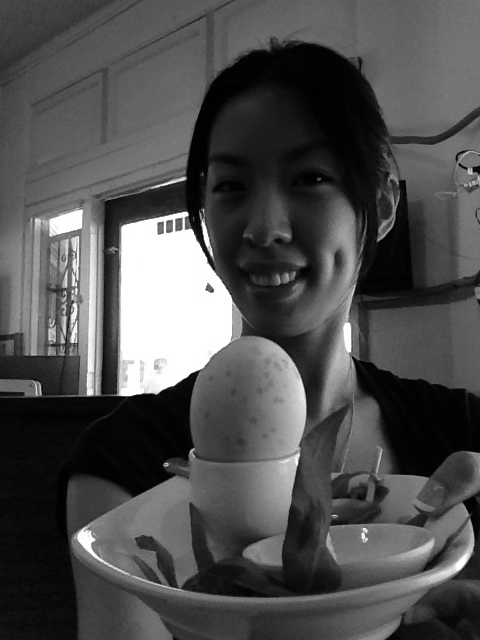 This all depends of course, on how well your balut is cooked and how old your egg is. Bahn Xeo Quan 8742 E Garvey Ave Rosemead, CA 91770 Happy Eatings! Live a little! Give it a try!